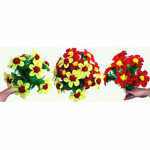 Produce a giant colorful flower bush instantly! NO SKILL! Incredibly easy and very colorful! These are VERY hard to find- when we finally get some, we can't keep them in stock! An attention-getting way to open or close your show! Start by showing the empty narrow cylinder, and place it on a table (or even hold it in your hands). 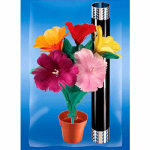 At your command, you lift the tube and INSTANTLY a LARGE and SHOWY bouquet of flowers appears! And yes, it's THAT FAST! Another way to present this flower miracle is to show a single pretty flower (not included, but you can use any flower, real or artificial), and place it into the cyclinder. 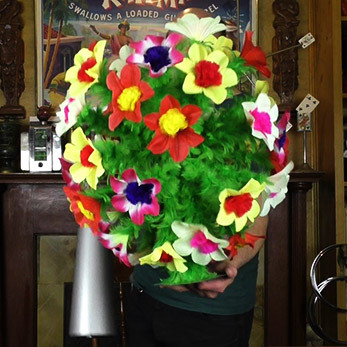 When you lift the cyclinder, the single flower has magically transformed into the full bouquet of colorful flowers! 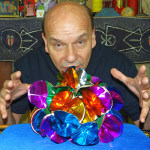 This flashy and impressive trick is extremely easy to perform, and shows up well at a distance. It can be performed at close range as well, or even surrounded! Best of all, it sets up quickly and easily. Wonderful way to add color to your show- and make it look bigger! Produce the botania at the start of your show, and leave it out on a side table throughout the show. Looks great! Propose with style! Attach the engagement ring to the center of the botania. 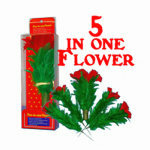 As she watches, drop a single flower into the tube. Lift the tube, and the flower has changed to a big bouquet of flowers- with the ring in the middle! This is even bigger than it looks in the video. Thanks for the tips about how to take care of the flowers. They do shed a little, but I have had other flowers made of the feathers and they shed too. 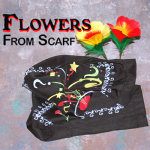 When I use these flowers in my show I find that it is more about the surprise that the flowers appear than it is that it fools you on how they appear. I also took your suggestion about keeping them on a side stand for the rest of my show to make it look more colorful. That was a great idea. I use these flowes for almost every show I do. Buy this item - get 190 Rewards Points!